During SPRING festival in May 2018, I visited the performance piece Think Much. Cry Much. by Rima Najdi, which took place within the URBAN HEAT project initiated by the Festival in Transition network. Rima Najdi’s piece came forth from her travels though Europe and talking to “people who build, guard, fence, cross, challenge and negotiate borders.” With this material, she created “a radio drama,” which intertwined instructions to perform different characters in the play of borders and migration with listening to the personal stories of refugees. The performance took place on a concrete field of the former workplace of the Dutch railing system in Utrecht. It remotely resembled a sports field as it was marked with differently coloured lines. 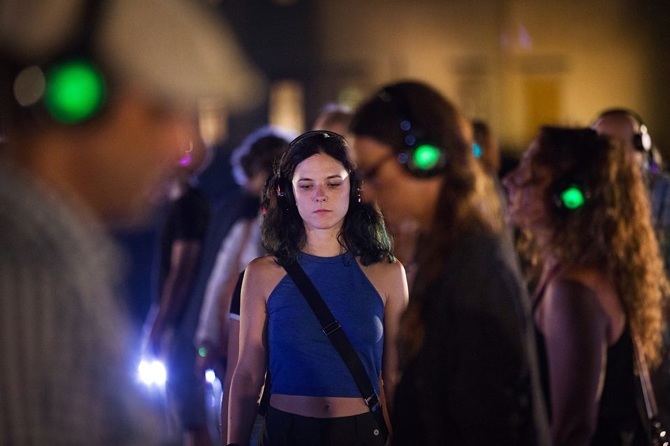 Before the performance started, every participant received a team colour and a matching headset, which was synchronized for all the team members. 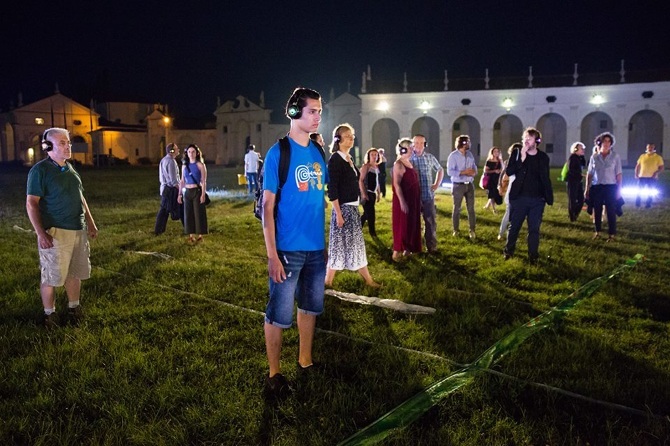 Through the audiphones we received instructions to enact certain roles, which were strictly scripted and abstract (the instructions included simple gestures as standing on a certain spot and waving or making swimming movements in the air). Our movements were mostly structured around the lines in the field (e.g. we had to walk on certain lines, stand on certain places etc.). Sometimes it was clear what role we were enacting, but often remained to be guessed. After the performance, when we received a flyer about it, I could see that the characters we played were Witness, Good Citizen, Journalist, Volunteer, Policy Maker, Police and Bad Citizen. At the end of the performance, every team went through all the roles. This was a very interesting experience, as from every role you perceived the other roles in different ways. For example, as a Bad Citizen, we were instructed to negatively judge another team, later, when we were in the role of this other team, we found out that this is the Police. It seems to be implied that if there is no exiting ‘deliverable,’ the performance failed. It seems that Rima Najdi has anticipated this kind of reaction. At the end of the performance piece, all participants received a flyer. A note on the backside of it reads as a disclaimer: “WELCOME TO THINK MUCH CRY MUCH. A PERFORMANCE PIECE THAT WILL NOT CHANGE YOUR LIFE.” Najdi continues writing “For your safety, this piece will not represent refugees, or try to create empathy […] it will not mention the word ‘crisis’ at all.” This can be understood in at least two ways. On the one hand, it seems to be a criticism towards those who practice a kind of ‘political escapism,’ shutting themselves off from intense engagement with politics in order to be able to continue a comfortable life. On the other hand, it can be understood as a critique of the romantic expectation that art somehow can deliver meaningful political change as a commodity. In what will follow, I will show how it is possible to understand Najdi’s performance as a critique of ‘change-your-life-aspirations’ in art and similar affective responses. I will argue, that instead of understanding the performance as something which delivers strong emotional reactions and stimulates immediate political activism, a more productive understanding can be gained by looking at it as interface, an interaction of different realities embedded in a larger political process. Rima Najdi’s performance piece is remarkable as it offers the participant a wide diversity of instructions and stories. For example, it contains humorous elements (e.g. the instruction “smile, because you are the elite”), intimate moments (e.g. we were instructed to lean our head on the shoulders of a team member and touch their finger tops), awkward situations (e.g. we had to dance on a mirrored surface while being watched by others), and exhausting tasks (e.g. the instruction to put our hands in the air for what felt like a really long time). Nonetheless, I experienced the general tone of the performance as rather quiet. Najdi refrained from blaming or victimizing certain roles, she did not retell the stories of sinking boats, children dying in Aleppo, or the outrageous remarks of right-wing politicians. Instead, we listened to the story of an asylum seeker, which included a lengthy description of the dinner they received in the asylum centre and at what time they had to go to bed. Source video: Supercontinent / Drodesera / Rima Najdi “Think much. Cry much.” on https://vimeo.com/227410434. In this sense, Najdi seems to set a counterexample to “phatic communication,” a term brought forwards by Malinowisk to refer to communicative acts which are more concerned with evoking an emotional response instead of conveying information. This is further theorized by Eric Kluitenberg who came up with the term “Affect Space” in an article he published in 2015. In the aftermath of the vast array of popular protests, which emerged around 2011 in various parts of the world including Zuccotti Park in New York City, Tahrir Square in Cairo, Gezi Park in Istanbul, and the streets of Hong Kong, Kluitenberg wonders how these movements were capable of attracting such a high amount of popular support, and, given this situation, why nonetheless these movements were still not capable of engendering meaningful political change. Kluitenberg analyzes this phenomenon with Brian Massumi’s concept of affect, which he roughly defines as a precognitive, nonconscious, corporeal intensity. Two aspects of affect in this context are of central importance. First, he analyses how dramatic images and catchy slogans were able to produce an immediate emotional response of solidarity. Second, the semantic openness of the protests (precisely because affect is precognitive) was capable of uniting large amounts of people short term. However, deliberation, Kuitenberg writes, “is in direct opposition to affect,” but unavoidable for political change. Thus, when an actual conversation between the different parties involved in the protest started, many ideological differences emerged. From this perspective, one may conclude that affect may have a very strong immediate impact, however, it does not necessarily grant long-term engagement and a sustainable dialogue. This does not mean that evoking affective responses necessarily dooms any politically motivated act/performance to fail. It can be used also very effectively and even cannot be totally prevented, since even language resonates with affect in differing degrees. Inevitably, affect can also be traced in Rima Najdi’s performance. For example, the moment, which hit me strongest, was when the names of refugees who committed suicide in asylum centres were read out. But also, when we were facing a team member who is brightly smiling at you, some sort of affective response is evoked (even if the smiling has been an instruction). However, even though Rima Najdi does not prohibit affective reactions, I would argue, that with her performance piece she also wants to go beyond this kind of engagement inducing deliberative elements into the performance. For example, there were small pauses in the radio drama, which gave time to ponder. Also, we were encouraged to make critical decisions: One of our instructions was to look at the person in front of us and “if the person is different from you, move on” which triggered at least for me personally some ethical questions (on what do I base my decision? Is it bad to be different?). The deliberative dimension of the performance piece was epitomized with the flyer we received after the performance. Instead of for example showing refugees on the road, this flyer depicts in a somewhat abstract manner the ‘playing field’ of the performance piece, it showed the differently coloured lines, which were drawn and taped on the asphalt together with all the different roles and their names. The map, as a precisely calculated document typically used for orientation, navigation and, phrased slightly more abstract terms, to makes sense of one’s environment, does not only metaphorically stand for a rationalized view on the world, but also really changed my perspective on the performance by triggering new thoughts. When looking at the map, I noticed much clearer the very careful composition of the entire performance piece and the interesting ways in which the different groups relate to each other. For example, there was a centre-periphery dichotomy, with the Policy Makers and the Good Citizens in the centre, surrounded by the circling Volunteers and the Bad Citizens and Witnesses in the periphery. The Journalists were only making photos of the bad citizens. This poses questions of how different population groups in society relate to each other, in what sense are they similar or different from each other? One could, for example, understand it as a critique of the popular press to be obsessed with disasters, crime and sensationalist celebrity stories, instead of engaging with more in-depth journalism by for example listening to the stories of the witnesses or the positive stories of the volunteers. The volunteers circling around the centre could be seen as unintentionally upholding an inherently unjust system, since by doing free labour and ‘keeping the refugees calm,’ they allow the government to neglect their responsibility. These thoughts, whether intended by Rima Najdi or not, show that after the performance, the map inspired me to think about the performance in an entirely new way. I was now focusing less on the personal encounters and bodily experience I made during the performance and looking more at the spatial organization and relationality of the different elements. Thus, due to the rather quiet tone and elements of the performance piece, inducing a deliberative dimension, it did not seem to evoke an extreme emotional response that could potentially result in a sudden mass-movement. However, expecting this kind of outcome from a performance would be to understand it as a deliverable product or a commodity to acquire. The initiative [urban interfaces] proposes an alternative approach to urban interventions such as Rima Najdi’s performance piece. According to them, it is the interfaces that can be used as a conceptual lens to make sense of urban phenomena precisely of this kind. In this sense, Galloway’s concept of the interface, sheds a more interesting light on the performance, since according to him, an interface is not an object. Instead, he conceptualizes interfaces as “thresholds” or “mysterious zones of interaction that mediate between different realities.” The idea of different realities mixing together is useful to understand the mechanisms of the performance, it quite literally mixes different realities together: as participants of the performance piece we listen to the personal stories of refugees and witnesses, we slip into the roles of the game, we encounter strangers and communicate with them, we momentarily withdraw form our roles winking to the person next to us, and we make sense of the performance piece by relating it to the political realities of borders and migration. It is remarkable that Galloway refers to interfaces as “thresholds” and “zones” simultaneously. Later on he writes, “Interfaces themselves are effects, in that they bring about transformations in material states. But at the same time interfaces are themselves the effects of other things, and thus tell the story of the larger forces that engender them.” This provides further inside of how we can understand the reality of the performance, the ‘interface itself,’ in relation to ‘other things,’ in this specific case daily life and the politics of migration and borders. 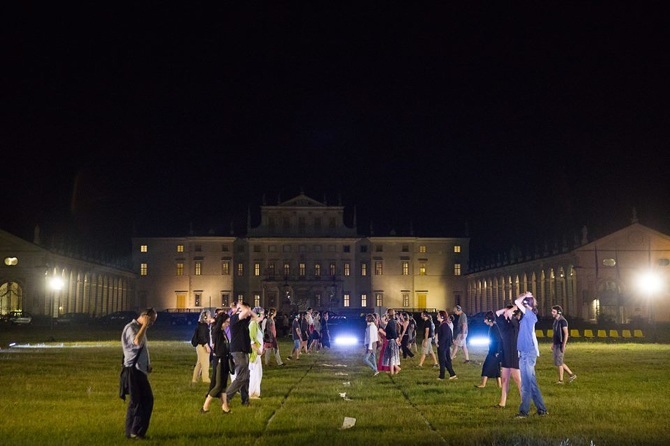 Even though the performance piece was clearly confided to a “zone,” the specific demarcation of the field and a precise time slot, our experiences from ‘outside the zone’ seeped in. In the first place, they inspired Rima Najdi to make this specific performance piece and also they allowed us to make sense of it. Reversely, the performance piece continues to have an effect on us, and some of the stories and experiences we made still resonate with us and enrich our realities of everyday life. Due of this permeability the performance piece can also be seen as a threshold, a border that can be passed. This already alludes to another point Galloway makes about interfaces. He sees the interface as a “process,” or an “effect.” This is very literally the case for the interactive installation of Rima Najdi, as the environment, the technology and the participants collaboratively create the performance, it is not there beforehand. But also, due to the ‘threshold-quality’ of the performance piece, it is embedded in a larger process of socio-political developments. The afternoon in May did not mark a ‘life-and-world-changing-peak,’ it was not screaming for extreme reactions. This, however, does not reduce the significance of it, or plays down topics raised. In fact, one could argue the contrary. By addressing a tragic, emotionally laden, and violent issue in a rather quite, playful and considerate way, I felt that she is paying more respect to the actual political situation: she was not exploiting the suffering of refugees to give radical meaning to her work, providing it with some urgent raison d’être. All in all, by embedding the performance in a larger process of thinking and crying about borders and migration, Rima Najdi did not delude the participants with affective slogans like “say it loud, say it clear: refugees are welcome here,” or “Never again is NOW.” Political passion and change does not fit on a poster and cannot be purchased with a ticket to a performance piece. One afternoon of art is too short to change our lives and a performance should not create this false impression. But maybe, if we cry enough and think enough, we will be able to embark on a process of change. Click here to show or hide the source list. Theaterkrant. Published May 19, 2018. Accessed June 13, 2018. Click here to show or hide the footnotes. “Think Much. Cry Much.” Urban Heat. Accessed, June 13, 2018. Rima Najdi does not include refugees as a role to play. She writes on the flyer we received after the performance “for your safety, this piece will not represent refugees.” It could be read as a comment on how all the characters in the play do not actually know what they are talking about when talking about refugees. The only reason why she revises her scepticism in hindsight is because she actually found that she left her comfort zone during the performance, which as I will argue in the following, is not really what the performance piece was about. 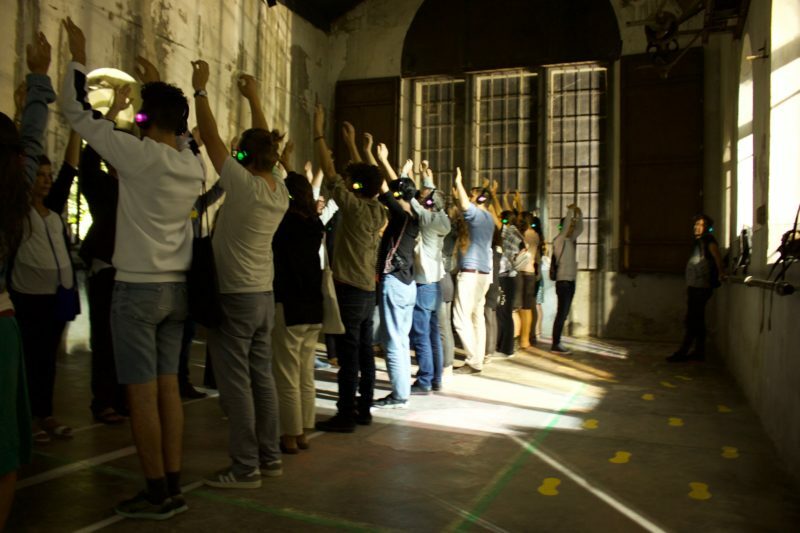 Eric Kluitenberg, “Affect Space: Witnessing the Movement(s) of the Squares.” Onlineopen.org, March 10, 2015, 5. Alexander Galloway, “Preface,” The Interface Effect (Cambridge: Polity Press, 2012), vii.